Grant Robertson by Jacky Carpenter. In the wake of its greatest triumph to date, the Coalition Government is about to face its greatest challenge. And one will have been the cause of the other. The far better than expected Budget surplus figures certainly came as a surprise, but may well be short-lived and more a product of the previous Government’s stewardship, rather than anything the current administration has done. Be that as it may, there is nonetheless little doubt that they come as huge fillip to a Government whose economic management has been under so much criticism. While the Government will understandably seek to milk every ounce of political advantage it can from this happy situation, as it should, Ministers will be well aware of the need to manage and downplay wider expectations of what this might mean. Even as affable and laid back a Finance Minister as the current one knows that igniting public expectations of a new spending spree would be both economically disastrous and near certainly unattainable, and consequently a monumental political blunder. Especially so, since this self-proclaimed “Government of kindness” has already increased substantially its spending, with the promise of even more to come, while ongoing decisions about how it all is to be paid for are left dangling. After all, ultimately, there is nothing kind about a Government that outspends its capability, and leaves its people struggling to cope when the inevitable retrenchment occurs. So, Mr Robertson and his more economically literate colleagues, although by no means all members of the Coalition one suspects, will, while smiling quietly and just a little smugly, want to let down public expectations, albeit calmly and gently, as befits the “kindness” label. Ironically, they have been helped considerably, and rather unintentionally, in their efforts to do so by the raw crudity and selfishness of their allies in the teachers’ unions, immediately and loudly laying claim to a fair chunk of the new surplus to settle their current salary claims. Now, this is not to dispute the legitimacy of their claims and their rights to pursue them through the already established channels, but more to make the point that leaping in so quickly to put their fingers on the money, as they did, was a mighty strategic error that has three impacts. First, it makes it much easier for the Government to now push back, as they already have done, citing the “no new lolly scramble” argument to send a wider signal of restraint. Second, it makes it actually a little more difficult for the Government to be seen to be too generous when a settlement with the teachers is eventually reached; and third, it runs a risk of alienating some of the considerable public support the teachers currently enjoy, if they are now seen to have become too pushy. Beyond the teachers, there are of course many other groups who will be eyeing up a part of the surplus for their interests, and the Government will be well aware of this. So it will be equally determined to send them a "kind" but firm message that its purse strings are not for additional loosening. None of this will be an easy sell, especially if the surplus figures hold up longer than expected, so it will require nerves of steel from the top downwards to continue the line currently embarked upon, and that will impose its own challenges. Former Finance Minister Sir Michael Cullen correctly and somewhat ruefully observed a number of years ago that managing Budget surpluses was a far more difficult task than managing deficits. When the Budget is in deficit, it is much easier for the Finance Minister just to say no to everything, however meritorious, because the money is simply not there. But in surplus times, the focus comes much more onto the quality and overall value of the new spending being proposed, and that requires Ministers to make some very strong judgements. In such circumstances, the admirable virtue of "kindness" is often not enough. A tough reality this Government is about to find out. Sometimes politics works in mysterious ways. So Mr Dunne is suggesting that Labour will find out that capital allocation decisions are bloody difficult. That simple easy answers tend to fall apart when you look more deeply. That bureaucrats aren't actually very good at them, as you always see what you want to when looking at the data. That all such decisions have a large element of guesswork. And that Gubmint drones tend not to be the best and brightest of the bunch (with some notable exceptions) so that the general intellectual horsepower is insufficient. And that because of the ponderous and well-signalled nature of most Gubmint initiatives (Oil and Gas being a startling deviation) most operatives in the tradeable sector can figure out and deploy workarounds well before the Fateful Day of implementation. And that nobody knows what they don't know (to quote Rumsfeld) so black swans (Taleb) can pop out of the woodwork (if that's indeed where they live or emerge from). Move along Peter, nobody wanted to vote for you and nobody wants to hear your bitter opinions .. slither back to Newsroom and take your recommendations to legalize synthetics with you. Are you disagreeing with his message or are you shooting the messenger? Your reputation is in grave danger through revealing that your thinking is shallow and biased by who is giving you the information. Peter Dunne's experience makes his opinion very relevant and valuable. His party lost it's seat, but it is not true that "nobody wanted to vote for" him. So please try to keep relevant? I don't seek the accolades of man. Evil must be opposed .. shooting him won't bring back those whom have died due to his policies, but we can certainly stop reading/listening to his insidious bile. Interesting comment. Who amongst our politicians do you not see as evil? And why do you see him as evil? Because his ways have led to death and continue to do so .. I invite you to come to Christchurch and talk to our hospital staff. Also, as a writer he uses insidious tactics to thinly veil his bitter biases - interest.co.nz can do much better than to keep him on as a commentator. A government surplus is, given a current account deficit, by definition a drop in net private domestic sector savings. They are taxing out more than they are putting in. Whether this is a good thing or not for NZ depends on the context. I see struggling public services, underemployment and mal-employment (crap precariat work), stagnant wages, low demand causing business to not invest much, deflationary tendencies (despite the one-off petrol thing) and problematic household debt. So you the government is in surplus - but at a cost - real and financial - to we the people. Government surpluses are private sector deficits (given a current account deficit). The growth strategy is private sector debt. That is not sustainable. Successive governments seem to think they are very clever, when all they do is enable the country to borrow more in order to push up the price of existing assets. Rising house prices = New Zealand is special, so it must be good. It is good, but only if you are a debt farmer. Sigh. Yep. What's the ideal way to spend the money though? Few months back I saw windflow in Christchurch folded because of about 22 mil of debt. The company had over a dozen staff and had overseas revenue. Without the debt they would have been profitable. In China the company would get a 0% loan from the government. IN NZ the staff were made redundant, and the overseas assets were sold to pay for the debt. Mr Dunne is right when he says that the previous lot probably deserve more praise than the current lot. However, Ms Ardern & Mr Robertson will not look a gift horse in the mouth. $5 mill is $5 mill. The other point is that we still owe $150 billion (that's billion) to the foreign banks. That's a lot of $5 millions. We have debt disease, like everybody else. Will it come back to bite us? You bet. Will it hurt? You know it will. Will we survive? Yes. But what sort of world will it be on the other side? The same boom & bust capitalist system as we've had for most of the last 250 years? Probably. Until someone comes up with a better way. He has obviously spent forward some of the apparent surplus, commendably in some areas like for those in need after the failed experiment of both political colour for thirty years. All he now has to do is to hold out against five million idiots (probably less harsh if we call them voters) who would find ways to spend the lot plus a bit more. He will get no praise from many and even less from his opponents who know how to squander assets to pay for tax promises. Peter Dunne: A blamed fence sitter and a howling sycophant. You forgot to add deluded and conceited. What surplus? 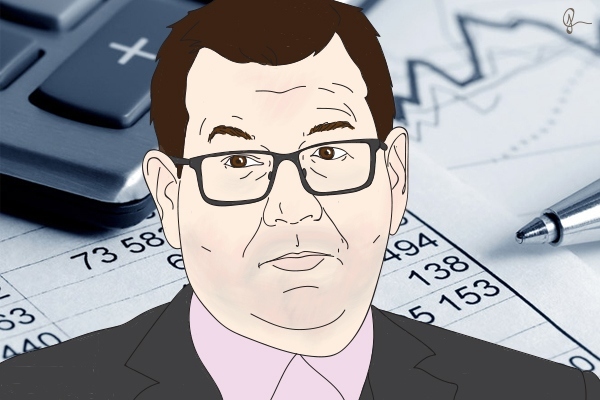 The govt has borrowed $6.5 Billion off-the-books this year via NZTA and Housing to keep it out of the OBEGAL figures, so in reality they've run a deficit of $1 billion. That is still a debt owed by the govt and taxpayers still have to pay the (higher) interest on that borrowing. Please apply that same logic to the last government and report back to us your findings. Thank you. Calling this surplus as a Greatest Triumph to date, for the Government is about as shallow as it gets. And really disingenuous. Peter Dunne tried to set up the NZ government as a moral punk drug pusher.